Don't panic! Susan Erasmus breaks down all you need to know about the first budget of President Cyril Ramaphosa’s presidency. Whether you are interested in finances or politics makes no difference: these things still affect every aspect of your daily life. And Wednesday’s budget speech is going to have some impact on your life just about daily in the coming year, whether you are agonising about your rent or your municipal bills, your clothing accounts, paying off student loans, buying a new phone, or registering for a child grant. 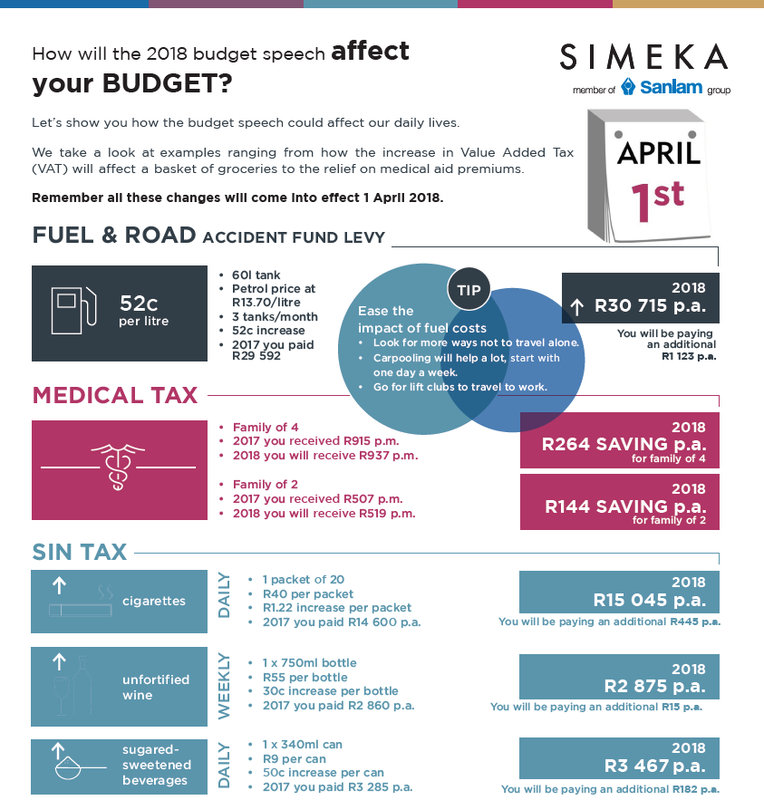 Here are some questions and answers about this very important budget speech. Q. Why is this budget more important than that of other years? A. We have a new president, and with that comes changes, not just as far as politics are concerned, but also on how the government spends its money. Many questions have been asked on how government money was spent in the last decade, as there was a shortage in the budget of about R50 billion rand by October last year. People are hoping that government spending on unnecessary things will be reduced, but that it will be increased to pay for important things, such as helping the poor in various ways, and paying for higher education. But that money has to come from somewhere, and most of any country’s available funds come from various taxes, such as personal tax (paid by all employees who earn over R75700 per year), company taxes, petrol levies, VAT, and taxes on imported goods. If you pay for services, such as your municipal bills... you will see that fourteen percent is added on to your account. Q. What is VAT, and how does it affect me that it has gone up to 15%? A. VAT stands for value-added tax, and you pay that just about every time you buy anything, or make use of services. It is included in the price of just about all the goods you see in shops. So, if a dress has a price tag of R1000, you will see on the invoice you get at the till that 14 percent of that is for VAT. Of that transaction between you and the store, R140 will be for VAT, and will be paid by the store to the government. If you pay for services, such as your municipal bills, or your cellphone bill, you will see that fourteen percent is added on to your account. So if you used a hundred rands’ worth of water, the bill you have to pay will be R100 plus R14 - R114 in total. That is until the 31st of March. From the first of April, you will pay R115 for the same water bill, and the total price of the dress mentioned above will go up to R1010. VAT has been 14% since 1993, so it is a big step to put it up. Q. What do I not pay VAT on, now or in the future? A. Certain basic foodstuffs are zero-rated, such as maize, bread (with the exception of low-GI bread and rye bread), maizemeal and samp, fresh fruit and vegetables, some tinned fish, rice, milk, eggs, and a variety of beans. Some other things on which you don’t pay VAT are petrol and diesel, your rent, public transport, paraffin, overseas flights (other taxes apply, though), and educational services. If you take public transport... the increase in costs is likely to be passed on to you as the passenger. Q. Will I pay more for my transport? A. Probably yes. If you have a car, you will be paying 52c per litre more for petrol, as the general fuel levy has gone up from R3,10 per litre to R3,62 per litre. The fuel levy is a tax you pay on petrol every time you put in petrol, and the total fuel levy makes up about 39% of the total petrol price. A portion of that goes to the Road Accident Fund, from which you can claim compensation if you are injured in an accident. But much of the fuel levy goes into general government coffers and are spent on other things. If you take public transport, which uses petrol, such as a bus or a taxi, the increase in costs is likely to be passed on to you as the passenger. These costs are also likely to affect train passengers in the long run, as they also go up when the buses and taxis do. Q. What are sin taxes and by how much will they go up? A. These are taxes levied on alcohol and tobacco products. These are going to go up between six and ten percent (alcohol) and 8.5 percent on tobacco. These are seen as luxuries, which is why they are always heavily taxed. If you are paying R35 for a packet of cigarettes now, that will go up to just under R38. A R50 bottle of wine will cost you about R54 from the 1st of April. The cost of partying is definitely going up. Q. Will I pay more tax on my salary? A. No, you are likely to pay less tax in the next financial year. If your taxable income is R15 000 per month now, you will pay R432 less tax per year. If you earn R20 000 per year, your taxes will go down by almost R1000 per year. If you earn less than R6500 per month, you will not pay any tax at all on your salary. However, if you earn a really big salary, your reduction in taxes will be very low. Q. What is the story on free higher education? A. The government has undertaken to provide free tertiary education to all new first-year students from 2018 (other students will still have to pay for now) from households where the total income is less than R350 000 per year. This includes universities and technical colleges. So if your mom is a single parent, who earns R180 000 per year, and she is the only one working, you will qualify. However, if your parents earn R360 000 per year in total, you will have to pay for yourself. National Student Financial Aid Scheme loans, which in the past had to be paid back, will be converted into bursaries. It must just be remembered that students who are not bursary holders will still have to pay for their living costs and that institutions won’t take any new students for 2018. Q. What is this new sugar tax? A. This is an effort by government to control the high obesity rate in the country. It is called the health promotion levy and means, that you will pay more for sugary drinks – in fact, 2.1c per gram of sugar per 100ml, above 4g per 100ml. That means that the first teaspoon of sugar in 100ml of the drink is free – thereafter you pay. Coca-Cola Classic has about 10 grams of sugar per 100ml, so you will pay a sugar tax of 6g (10g minus 4g) times 2.1c per 100ml of Coca Cola. That’s about 12.6c per 100g and for a 330ml can that will amount to about 41c extra on the price you pay. ... there is talk of reducing taxes for companies who take on more employees, especially younger people in internships. Q. What about all the unemployed young people? A. In 2017 unemployment, also among the youth reached its highest level since 2003. It looks as if the government is making job creation for young people a priority, and there is talk of reducing taxes for companies who take on more employees, especially younger people in internships. Details to follow once consultations have been done with stakeholders. Q. What about the child support grants? A. These grants are paid out to parents who earn less than a certain amount of money. The child and the parent/parents must live in South Africa. This grant, which is now R380 per month, will go up to R405 in April 2018. The grant is usually paid out to the person actually caring for the child. There are other grants, such as foster grants (when you care for someone else’s child) and pensions. All of these will be going up by more than the inflation rate. Q. What about my debts? Will they cost me more to pay off? A. Many South Africans have clothing or furniture or credit card accounts. The interest rate has not gone up, so you should not be paying more every month on your car, your clothing account or your bond, if you have bought a flat or a house. In fact, the news looks good on this front, as the rand is doing well against international currencies such as the Dollar and the Pound. That means people have confidence in the economy of South Africa, and there might be new foreign investors, who bring money into the country. That means the interest rates you pay on your accounts should not go up. They might even come down. If they do, use the opportunity to get rid of debt, instead of making new ones. Q. What about my designer jeans? Will they cost more? A. If they are made in South Africa, you will pay the same. However, if they are imported from other countries, the excise (tax in imported goods) tax will go up from 7% to 9% if they are classified as luxury goods. This cost will be passed on to the consumers by the shops. The same goes for anything classified as luxury goods, such as expensive imported tablets or phones or handbags or shoes. You might have to switch to local designers. Loans: Who should South African consumers go to first?